How do you choose between saving the life of a pregnant woman or that of her unborn child? It’s a moral dilemma with no easy answer, particularly from the perspective of the Catholic Church, which teaches that life starts at the moment of conception. The Rev. Drew Royals faced this very question recently from a man who called en route to the hospital with his pregnant wife, who had previously been diagnosed with an ectopic pregnancy. Royals admitted it was among the more challenging conversations he’d faced in his 12 years as a priest with the Archdiocese of Washington. He is currently leader of St. Joseph Catholic Church in Morganza, in St. Mary’s County. Luckily, Royals still recalled what he learned from a medical ethics class during his time as a seminarian at Mount St. Mary’s Seminary in Emmitsburg. “All I could do in that moment was recite what I remembered from that class — that his intention was to save his wife and having peace of knowing that the side effect or consequence of losing a child was not the intent,” Royals said. Royals said he felt grateful for the Mount for giving him a strong educational and theological formation. The man he counseled later thanked him when they crossed paths several months later. There were, of course, many more times that the situations and skills regarding what he learned in his five years at the seminary did not so directly translate to practical application as a diocesan priest. Still, Royals credited the Mount’s strong seminary program with giving him the best preparation possible to take his vocation from the theoretical to the practical. Monsignor Andrew Baker, seminary rector, also touted the strength of the Emmitsburg seminary’s program as one of the reasons why seminary enrollment has increased in recent years. “The reason we’re here is to form priests, and we’re forming very good priests at the Mount,” Baker said. The 145 seminarians enrolled at the start of the 2017 academic year was among the highest enrollment numbers of any seminary throughout the country, according to Baker. 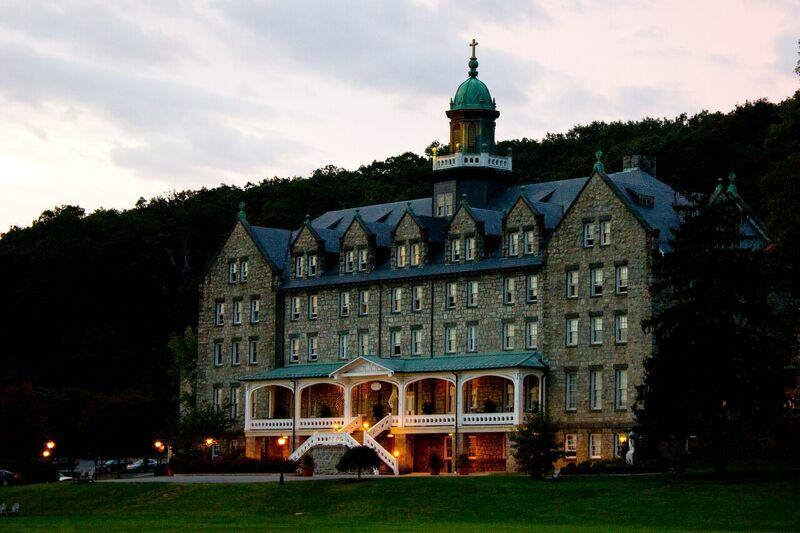 Total enrollment also represented a 21.8 percent increase over the prior year’s enrollment, though it was lower than those of the 2014-15 and 2013-14 years, which boasted 158 and 165 students respectively, according to information collected by the seminary. 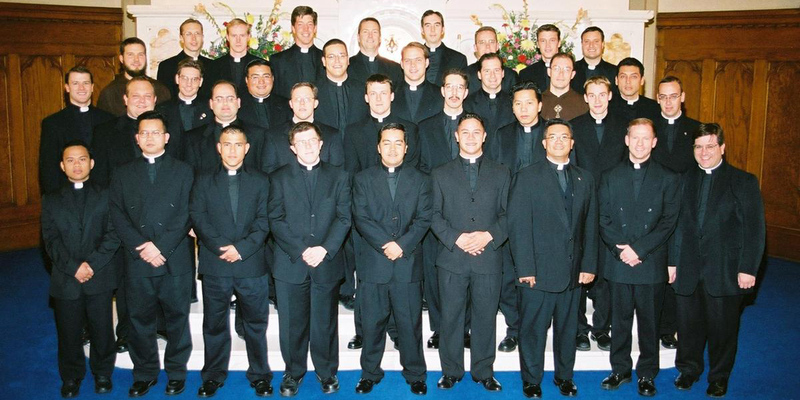 Seminarians also come to the Mount from dioceses across the country and the world, according to Baker. Those who were enrolled at the start of the fall 2017 semester represented 22 dioceses or religious orders, though enrollees in prior years have come from as many as 32, according to the seminary. Baker noted the Mount’s location on a university campus as an added attraction for diocesan bishops, who choose which program their seminarians attend. “Bishops are seeing that the model that really helps prepare men best is a model where seminarians have a little more contact with the rest of the world, where they aren’t just isolated from the rest of the world and the culture that is around us,” Baker said. Despite national reports of the increasing secularization of America, vocation in the Catholic Church has remained stable over the last several decades, which was “pretty encouraging,” said Mary Gautier, a senior research associate for the Center for Applied Research in the Apostolate at Georgetown University. The center tracks enrollment on every Catholic ministry formation program in the United States and publishes an annual report of its findings. The latest report counted 3,369 men enrolled in theological programs, which does not include college or high school seminary programs, in the 2017-18 academic year. While this is far fewer than the 8,159 men enrolled in theological programs in the 1967-68 year, the earliest recorded in the report, it’s on par with that of the last two decades, Gauthier said. Nationwide, theological seminaries boasted a 75 percent retention rate in 2017-18, according to the Center for Applied Research in the Apostolate report. Although the Mount has not kept strict data on retention rates within its program, Baker estimated about 90 percent of those who enroll continue through graduation and ordination. Absent historical data, Baker alluded to what he described as “serious retention problems” with Catholic seminaries in the 1960s and ’70s. He chalked up the higher rates of seminarians leaving formation programs, and newly ordained priests leaving the priesthood, to the instability of the era: the cultural and sexual revolutions of the larger society and the changes within the church under the Second Vatican Council that began in 1962. The declining participation in organized religion taking hold in subsequent years has forced the faithful, including those who choose to pursue the priesthood, to be even more committed before entering the seminary, Baker said. What Baker described as a “materialistic and godless life” can also make people crave something more meaningful, something like God. For Royals, this conflict came when the parish priest at his childhood church of Our Lady of Lourdes in Bethesda was murdered in 2000. Royals, whose faith was an integral part of his childhood and later studies at Providence College, a Catholic university in Rhode Island, had never contemplated the priesthood. The horrific loss of his childhood priest planted the seed for a vocation, Royals recalled. Heading into his senior year, still planning to pursue a career in acting, he began to wrestle more seriously with a very different calling, consulting with other priests at his college and later, the Archdiocese of Washington. His decision to apply to the diocese, made late in the second semester of his senior year, was spontaneous, Royals admitted, framing his subsequent arrival at Mount St. Mary’s Seminary in the fall as an opportunity for discernment. That Royals was entering the seminary during the peak of the clerical sexual abuse and molestation scandals in the Catholic Church did not deter him. The sexual abuse scandal had subsided at least a bit by the time the Rev. Rob Maro started at the Mount seminary in 2006. But Maro, who had already spent 10 years in a church setting as the religious education director for The Shrine of the Most Blessed Sacrament in D.C., was similarly aware of the conflict between an increasingly secular society and Catholic values. Maro’s prior decade of work experience in the church, as well as his bachelor’s and then master’s degrees in theology, helped him prepare in a way that by the time he entered the seminary, at age 38, he already felt fairly certain of his calling. His studies at the Mount only helped increase that confidence in a priestly calling, Maro said, unable to recall a time during his seminary years when he contemplated leaving. Baker emphasized that a seminary retention rate is different from that of a typical university. While the ultimate goal is graduation and ordination, seminary leaders also want men who realize the priesthood is not for them to feel they can leave if they want to. Royals, who saw his entrance into the seminary as a time to think and to decide whether the vocation was indeed for him, said he never seriously doubted his decision. “There might have been a natural hesitancy halfway through, only because I realized the reality of what I was about to do ... kind of like, ‘Wow, do I really want to do this?’” Royals recalled. As society changes, so too have the seminary programs, which now focus not only on the academic training but also the spiritual and practical applications of the priesthood, Baker said. “It’s not simply about getting to the next grade, and there’s much more attention given to [the] whole person,” he said. Royals noted that the emphasis on prayer in the Mount seminary’s program has been particularly instructive in his subsequent experiences as a parish priest. “The formation in the seminary that is spiritual is very, very helpful because you learn to pray and you learn to rely on God, and that’s something you’re constantly having to do in the ministry,” Royals said. The pastoral formation component of the Mount’s program, which sends seminarians out to schools, prisons, hospitals and other parishes to apply their ministry in real-life settings, was also instrumental to Royals’ preparation. In particular, he recalled his assignment at a church in Hyattsville, helping and learning from the parish priest. Maro, who now serves as pastor at St. Francis Xavier in Leonardtown, also recalled the example set by the priests who served as faculty and advisers in the seminary program. Their holiness and inspiration, combined with what he termed a “top-notch” education and countless opportunities for spiritual guidance and exploration, made Maro feel ready to take on the challenges of the priesthood when he graduated in 2015. Like Royals, he found many situations in which his seminary preparation aided him in the transition from seminarian to priest and later, from serving under a senior pastor to leading a parish of his own. Still, even the best training program could not have fully prepared him for certain challenging experiences: hearing confessions, bringing communion to the sick and praying over the dying in their final moments of life. One of the lessons Royals has learned with experience is how to deal with the tension that results from advocating for church principles his congregants might not want to hear, particularly on issues of marriage and family life. Royals also pointed to a correlation between the vocation of married life and the vocation to the priesthood. Witnessing his parents’ strong marriage was key to his own vocational calling, and he feared the dissolution of marriage would adversely affect the number of men realizing vocational callings. Maro expressed optimism for the future of priestly vocations. He pointed to the example and influence of Pope Francis on the church in a global and institutional sense. More locally, the Archdiocese of Washington has benefited from high numbers of seminarians, even recently opening up a new seminary program, which in today’s context is “pretty much unheard of,” Maro said. Maro has relished the opportunity to cultivate and advise one such seminarian who is interning with St. Francis this summer in the same way older priests helped him when he was a seminarian. His favorite part, or at least one of them, is having Mass with his congregants. “Giving them the Eucharist, sharing the Lord’s body and blood, is the greatest joy a priest can share with his congregation,” Maro said.